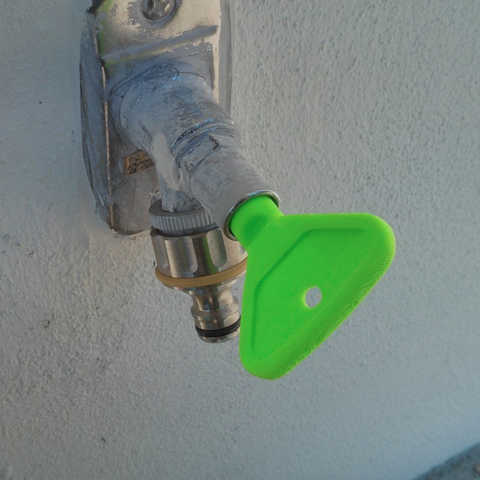 Outdoor water faucets have a tendency to loose their plastic key during the winter season. Next time this happens you can simply 3D print yourself a new one. The key was 3D printed in ABS plastic which sometimes needs to be fixed during 3D printing, specially under overhangs. As an experimental alternative to letting MakerWare create support structures, we chose to create them ourselves. This was easily done inside netfabb Studio Basic by creating flat box primitives and placing them under the overhang areas as well as intersect them with the model of the key. This is in most cases a preferred method of supporting only the necessary overhang parts of a 3D model. The bright green colour was chosen on purpose to make the 3D printed key stand out on the ground in case it would fall off and get lost again.